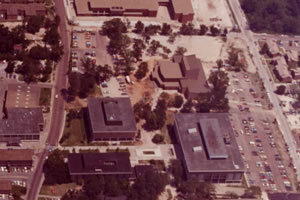 The theatre center was a new building when this aerial photograph was taken. 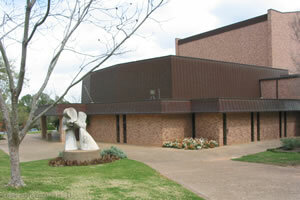 The University Theater Center is located on the east side of campus and, as evidenced from its name, classes for the drama department are here, as are campus theater and dance productions. The Theater Center was the result of the university's plan for an immense Fine Arts Center that was to house the art, music, dance, and drama departments. Planned for the northeastern corner of campus, a shortage of funds decreased the project size and only the drama department received the completed facilities. This process would repeat itself a decade later: the remainder of the center was proposed but inadequate funds yielded one building (the Fine Arts Building) that eventually would house the department of music. The sculpture Double-Double stands out front the western entrance. The building contains two theatres – the 300-seat Erica Starr (Mainstage) Theatre and 90-seat University (Showcase) Theatre – as well as classrooms, design and dressing rooms, greenroom, and rehearsal space. It is connected to the Gaertner Performing Arts Center via a covered walkway. Presented 2003-2015 | buildingshsu is an independent website and not affiliated with sam houston state university.